My son-in-law is one of a kind - polite, genuine, funny, and wicked smart. His transition into our family was seamless, which says a lot, considering just how crazy we are. He is also, as we have discovered over the last couple of years, an excellent cook. This is a good thing because the other half of The Love Couple – First Born – is not exactly a fan of cooking. You can’t blame it on genetics. I enjoy cooking, even if I do it more out of necessity than an overwhelming passion for it. Spouse will occasionally chip in and make (most of) a meal, but if it’s anything special I am reminded of how good it was for an interminable amount of time. He made spaghetti sauce in 1986 and still talks about it. He brought his own cast iron pan. That’s correct. Even though I had a cast iron pan that was perfectly good, which he could have used it to make his delectable cornbread, he chose to check a bag at the airport just so he would have his own seasoned cooking vessel. Oh, and he also brought his own special-ordered grits. We discovered it’s not avocado season when the Groom attempted to make guacamole and almost broke the counter with the bag avocados he purchased (apparently, he wasn't tipped off when he needed a forklift to put them in the cart). While he sputtered over trying to chop up pieces of green rock, Spouse, Second Born and I ran back to the store and found the only five ripe avocados in Maine. The end result was an amazing guacamole that was completely wiped out within hours. I’ve used soap and a sponge on my pan. I don’t always dry it immediately after cleaning it. I have cooked eggs in it. A lot. In the world of cast iron cookware, these lapses of judgment could end in disaster. My son-in-law wasn’t taking a chance that my pan may not be seasoned properly or the appropriate weight for his cornbread recipe. He was correct - it wasn’t seasoned, but isn’t one cast iron pan the same as the next? Oh no, I learned. Different manufacturers and different eras meant different weights, as faithful cast iron users know. The Groom researched them, read reviews, and eventually found exactly what he wanted on eBay, not Wal-Mart... like some of us may have done. Because I was never going to get around to it, I took him up on his offer to season my large cast iron pan. This method involves applying and reapplying oil or grease (in this case, bacon grease) to the inside and outside of the pan, then baking it at 375 for about 45 minutes… I think. All right, honestly, I wasn’t fully paying attention except for acknowledging this was the one week in Maine where you did not want to have the oven on for any length of time. My son-in-law is trusting me to use kosher salt to clean my pans going forward. I didn’t make any promises but it was with a sigh of relief that I unearthed kosher salt in the cabinet, thereby proving that my intentions were good. I can’t let him down even though technically he showed me up. That cornbread was like a little slice of heaven. I will accept that someone younger can still teach me a few things… but I guarantee I’ll be doing the schooling when it comes to using a lasagna pan. Loved this! It's not about what it's about ... it's really about the guy, not the pan. Sharing. Wow! Who knew there was so much to know about the care and feeding of cast iron, Janine. 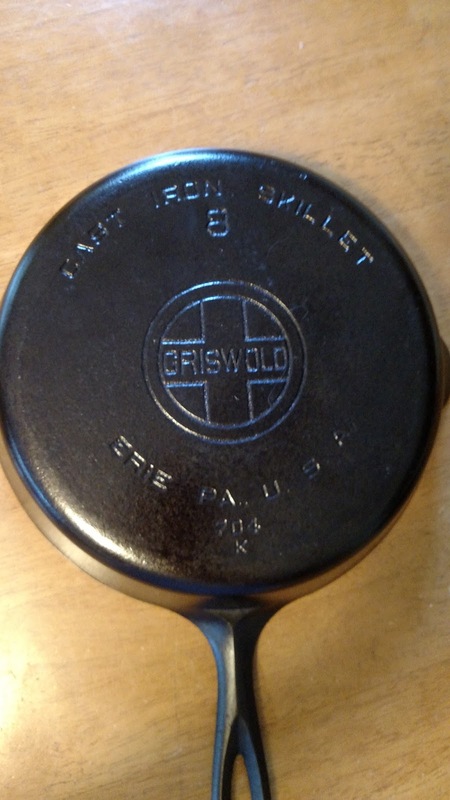 I inherited my mother's two cast iron frying pans, one regular size and one small. I routinely use the little one to cook my scrambled egg, and now I'm wondering why that is not a good thing to do. I don't use soap and water to wash and I always dry them. But I've never used kosher salt to clean them. I have a lot to learn from your millennial son-in-law, and I'm sixty-don't-ask.